New law: Astronauts Can Keep (or sell) Space Artifacts. America’s early space pioneers have now been confirmed as the legal owners of the equipment and parts they saved as souvenirs from their missions. President Barack Obama on Tuesday (Sept. 25) signed a bill into law granting NASA’s Mercury, Gemini, and Apollo crew members “full ownership rights” to the artifacts they received and retained more than 40 years ago. The legislation (H.R. 4158) was authored in response to recent challenges raised by NASA’s General Counsel and Office of Inspector General (OIG) over the attempted sale by several astronauts of their mementos. The issue came to a head in January after an inquiry by the space agency put a hold on the almost $400,000 auction of a checklist used by Apollo 13 commander James Lovell. “This bill seeks to eliminate any further ambiguity about Apollo-era artifacts that were received by the astronauts. It simply says that astronauts who flew through the end of the Apollo program will be granted full right of ownership of any artifacts received from their missions,” Congressman Ralph Hall (R-TX), chair of the House of Representatives’ Science, Space and Technology Committee, said. Hall, joined by ranking committee member Eddie Bernice Johnson (D-TX), introduced the bill in March. It was passed by the House Sept. 19. The Senate approved the bill three days later during the pre-dawn hours of Sept. 22, prior to leaving on recess. The question behind the legislation, if astronauts hold the rights to expendable space equipment — including their checklists, personal hygiene kits, and items that, had they been left aboard the Apollo lunar module would have been crashed into the moon — had gone largely uncontested by NASA until last year. Then, in a series of challenges, including a lawsuit brought against Edgar Mitchell, who was the sixth man to walk on the moon, NASA counsel began to insist that if paperwork couldn’t be produced documenting that the equipment had been released to the astronaut, then it was not legally his to own, donate or sell. In Mitchell’s case, the government sought the return of the data acquisition camera (DAC) that he saved from being destroyed on the moon. Ultimately, Mitchell settled out of court, agreeing to turn the camera over to the Smithsonian for its display. NASA’s General Counsel then raised questions about the title to artifacts sold in January by a Dallas auction house on behalf of James Lovell and Apollo 9 spacewalker Rusty Schweickart. One item in particular, a checklist that had been used to reconfigure the lunar module into a lifeboat on the periled Apollo 13 mission, made headlines after it sold for a record-setting $388,375. Heritage Auction Galleries put the sale on hold after NASA challenged the astronauts’ ownership. In response, Lovell, Schweickart and other Apollo astronauts met with Bolden at NASA Headquarters in Washington, D.C. to defend their “good faith” actions. The astronauts maintainedthat their managers had given them permission to keep the equipment at the time of their flights, but as the focus was on flying the missions, there was little, if any documentation produced in support of the equipment being transferred to their property. 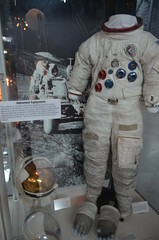 In the years since they flew, the astronauts donated many of the artifacts to museums and organizations, as well as sold items to collectors, which were at potential jeopardy if the legislation had not been passed. The bill, which in its final form is about a third the length of this article, succinctly defines what type of items are to be considered artifacts and which astronauts are now granted ownership rights. The legislation establishes the applicable artifacts as any equipment that was “not expressly required to be returned” to NASA at the completion of the mission, whether it was meant to be disposable, like a toothbruth, or was intended to be discarded on the moon, such as Mitchell’s camera. Separate NASA policies, established in 1999, govern the use of equipment as mementos on the space shuttle and space station. It remains unclear what status now applies to astronauts and artifacts from the shuttle missions flown between 1981 and 1998.